The laws ruling our oceans are definitely not ideal to avoid pollution. The International Convention for the Prevention of Pollution from Ships (MARPOL) adopted in 1973 stipulates that “In any case, no discharge of residues containing noxious substances is permitted within 12 miles of the nearest land.” If you are interested in the laws of the sea, read Oceans and the Law of the Sea by the United Nations and watch this video What Laws Apply In International Waters? 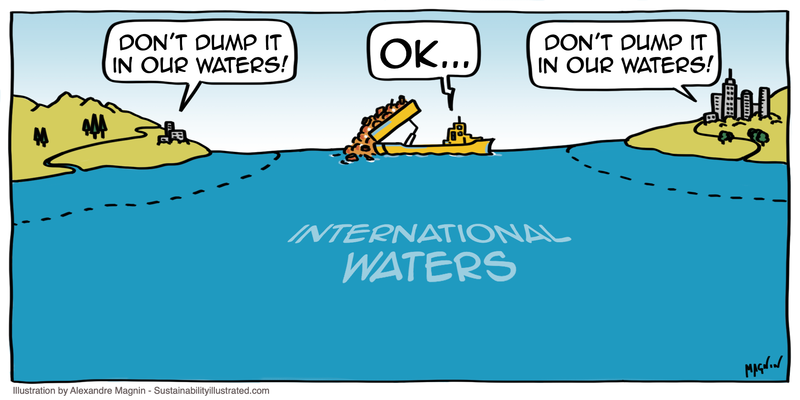 Find all our sustainability cartoons here. If you like our work, you can give us a tip here or become a patron here.